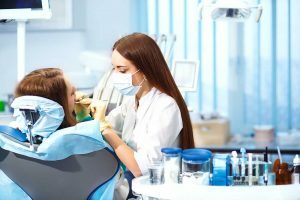 This job has many advantages when compared to a job of a dentist: You can earn your degree in two years, you will make nearly as much as dentists do (more than $70,000 in average), and most importantly, patients will actually look forward to visiting your practice (at least most of them will). 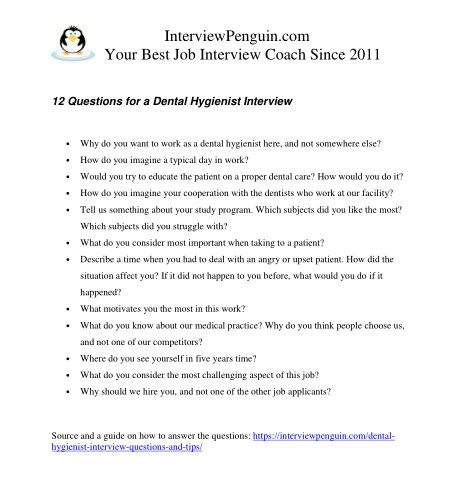 While some dental hygienists work on their own (and do not need to interview for a job), many others will work for an employer–a hospital, a private care facility, a private dental practice, a prison, a community health setting, or other. In all these cases, you will have to pass a job interview. 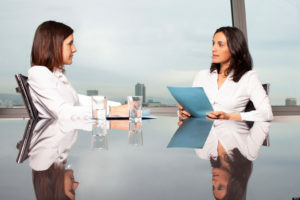 And while you will get some specific questions in the most specific settings (think a prison, or an Indian reservation), you can definitely get ready for the questions that are common in most interviews for this job. Let’s have a look at them now. Why do you want to work as a dental hygienist here, and not somewhere else? Would you try to educate the patient on a proper dental care? How would you do it? How do you imagine your cooperation with the dentists who work at our facility? You have a few options. The best one is identifying something you like about the particular healthcare facility, such as their reputation, the quality of equipment, the professionalism of other healthcare professionals working at the place, their values and goals, or anything else, and refer to it as to the reason of your choice. The second best alternative is pointing out a target group, such as prisoners, Indians, children, elders, etc. and say that you have empathy with the group, and prefer to work with them, instead of another group of population. Another alternative is simply saying that you like the location of the facility (good traffic connection from your home), the working hours, or anything else the makes the offer appealing to you. The exact duties depend a lot on the place of your work, and obviously the routine in prison will differ to the routine in a private dental practice. Read the job description carefully, and study the website of the facility, to understand exactly what they expect from you. If you are not sure, however, you can always refer to the most common duties, such as inspecting and cleaning people’s teeth and gums, particularly cleaning gingivitis, plaque and tartar from teeth, applying fluoride, and giving oral x-rays. You should definitely say that you would try your best. Demonstrating how they should clean their teeth and gums, and letting them to show you the correct application of the technique before leaving the practice, is a best possible way of instructing them. You can also say that you plan to distribute sample inter-dental brushes (and other tools for dental hygiene), helping the patients to develop proper habits when cleaning their teeth. Tell them that you are ready to cooperate, and that you expect the same from the dentists. Anytime you find a tooth decay while doing your work, even a small one, you should ask the patients whether they are aware of the problem, and suggest an appointment with their dentist. Likewise the dentists (and their assistants) should send the patients to you (when they find a problem with dental hygiene, one that a dental hygienist should address). Tell us something about your study program. Which subjects did you like the most? Which subjects did you struggle with? What do you consider most important when taking to a patient? Describe a time when you had to deal with an angry or upset patient. How did the situation affect you? If it did not happen to you before, what would you do if it happened? What motivates you the most in this work? What do you know about our medical practice? Why do you think people choose us, and not one of our competitors? 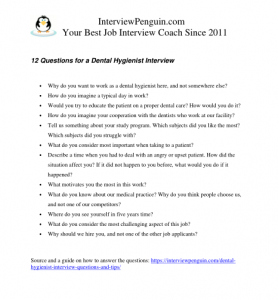 The difficulty of dental hygienist interview depends a lot on the number of job applicants. When you try to get a job at a popular dental practice, one that offers a great starting salary, you will typically compete with many other people. In such a case you will have to deliver your best, and show the right attitude and motivation in your interview answers. What are your weaknesses? Most people do not like to talk about their weaknesses. What is more, we often can not even tell our strengths and weaknesses, or have an unrealistic view of them. Learn how to identify your weaknesses, and how to answer this question in your interview.